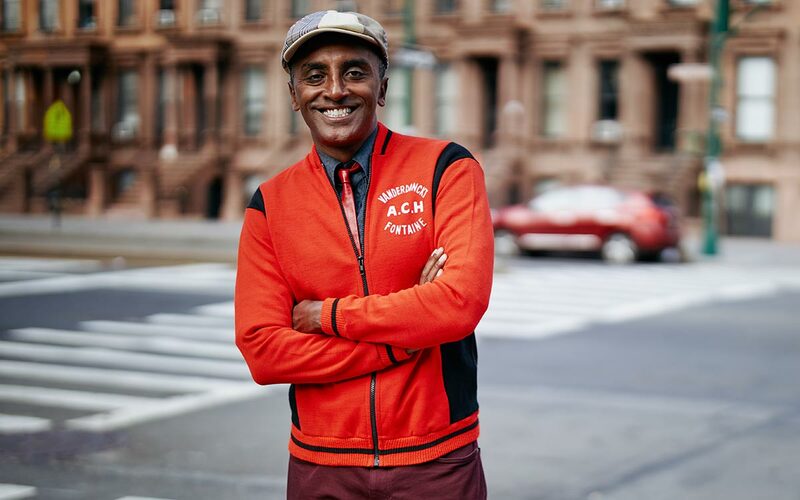 Whether cooking for the U.S. president or for a table of Friday night regulars, Chef Marcus Samuelsson turns to his immigrant heritage for inspiration. There’s Ethiopia for spices and cooking methods, Sweden for pickling and preserving techniques, and Harlem for boldness and diversity. But while Samuelsson’s food is regularly hailed by top critics, for him, cooking is about more than just accruing positive reviews and awards. It’s also about adding value to his community, celebrating the diversity of immigrants and minorities, and providing inroads for marginalized individuals. For Samuelsson, that journey has been winding. Samuelsson was born in Ethiopia, and when he was 2 1/2 years old, his mother walked him and his sister to the hospital. All three had contracted tuberculosis. The disease claimed his mother’s life. A nurse took Samuelsson and his sister in and, soon after, the siblings were adopted by a Swedish couple from Gothenburg. The children quickly took to their new home—especially the food. One of Samuelsson’s earliest memories is of standing in front of the fridge, admiring the contents inside. “We’d been underfed in Ethiopia, and the idea that food could just come out of this door was such a big deal to us,” he says. He soon learned, however, that the bounty of the fridge didn’t just materialize, but was the end result of a long process of collecting, preserving, prepping, and cooking—tasks oftentimes carried out by his maternal grandmother, Helga. With Helga, Samuelsson experienced “a constant motion of cooking and eating and learning about food from various stages.” She put him to work picking blueberries and rhubarb, pickling lingonberries and mushrooms, and catching and preserving fish. She also taught him and his sister to make bread, meatballs, and other Swedish staples from scratch. “Whenever she came to our house or we biked to hers, it was all about food,” Samuelsson recalls. He now realizes that these early lessons formed the foundation for his success as a chef. But while food was an integral part of Samuelsson’s childhood, for years he was focused on another calling: soccer. He seemed well on his way to becoming a professional soccer player, dedicating himself entirely to the sport and playing in matches throughout Europe and the U.S. At 16, however, he was unexpectedly cut from the team. While devastating at the time, the experience made him realize that “there’s others working just as hard as you,” he says, and that he would have to step up his efforts if he wanted to excel in the world. He decided to change tracks and reinvest the energy, precision, and commitment to excellence that he had been cultivating as a soccer player into his second great love, cooking. By 18, Samuelsson landed his first culinary scholarship, which soon led to opportunities in Japan, Switzerland, and Austria. He learned to navigate unfamiliar kitchens and cultures alike, and began honing his English language skills. His talent and hard work as a young chef-in-training culminated in a coveted position at Georges Blanc, a three-star Michelin restaurant in Lyon, France. He excelled there, as well, and after a year in the kitchen, the head chef tried to convince him to stay. But Samuelsson explained that he had clear goals and needed to move on. He wanted to own an internationally respected restaurant of his own. Samuelsson conceded that it was true that such a restaurant did not exist. Rather than be dissuaded, though, he saw the dearth of black-owned high-end restaurants as an opportunity to break down that barrier—not only for himself but for all people of color. But Europe, he thought, was far too rooted in outdated tradition to host such an establishment, so he decided to instead go to the U.S., where the “possibility of diversity,” as he puts it, is most vital. After settling in New York City, Samuelsson quickly proved his old boss wrong. He became executive chef of Aquavit, a high-end Nordic restaurant, and soon set the record for the youngest person ever to receive a three-star review from the New York Times. In 2003, the James Beard Foundation named him the best chef in New York City, and a few years later, he began appearing on competitive television cooking shows (which he won). He oversaw the first state dinner for the Obama administration and authored a bestselling memoir, Yes, Chef, while also finding time to publish cookbooks and a version of his memoir adapted for young adults. In the meantime, he opened restaurants of his own, in New York City and beyond. In addition to bringing visitors to the neighborhood and hiring from the community, Samuelsson teaches free cooking classes and runs Harlem EatUp!, an annual food and culture festival that he founded. He serves on the board of New York’s City Harvest, a nonprofit group dedicated to rescuing surplus food to feed hungry residents, and he co-chairs the Careers through Culinary Arts Program (C-CAP), an organization that provides food-related career opportunities for underserved youth. He is the host of a new PBS six-part series, No Passport Required, a show produced by Vox Media and Eater that takes viewers on a journey exploring the many ways that immigrants contribute to American food and culture.